I tossed a spaghetti squash in my basket, went home and created version 1.0 of this recipe. It’s a fun one to make. The bright colors! Those bold flavors! This recipe was inspired by last year’s super popular spaghetti squash burrito bowls. Instead of Mexican flavors, I opted for Mediterranean—chickpeas, basil and parsley, red onion and fresh pesto. I hope you all love it just as much as the original. I caught a fall chill in the air yesterday evening on my walk with Cookie, and I am so excited about the fall line-up I have planned for you. Let’s hear it for scarf weather and spaghetti squash! 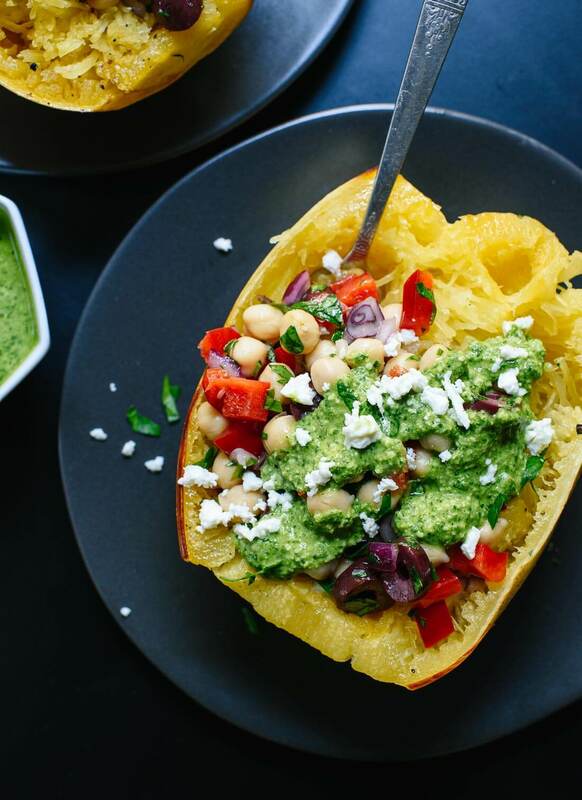 Roasted spaghetti squash topped with your favorite Mediterranean ingredients and pesto! This healthy vegetarian dinner recipe will make everyone happy. Recipe yields 4 servings (4 stuffed spaghetti squash halves). Recipe adapted from my spaghetti squash burrito bowls. *Change it up: You can use walnuts or almonds in the pesto instead of pepitas (although the dish will no longer be nut-free, if that matters). Make it dairy free/vegan: Just don’t add any cheese! wow… well funny thing is that i am making the spaghetti squash burrito bowls tonight!!!! hahaha I bought everything yesterday and it’ll be my first time making them but how ironic that then you post a new version today :) … both sound wonderful! and I know they will be! And happy fall/autumn ;) to you! No way! That’s so funny. I hope you love the Mexican version and get a chance to try this one, too. xo! So so creative! Love how satisfying this looks. and scooping anything out of a squash is a good time. Haha, so true. I’m looking forward to carving pumpkins already. Thank you, Meredith! I was so ready for fall this year that I was counting down the seconds but the weather really hasn’t been on-board here in Canada either. It’s definitely still shorts and sandals weather most days. I’ll be making this anyway tho, cuz it looks way too good to wait for mother nature to catch up lol. Thanks! I hope you love it. We’re finally starting to get some cooler weather here, so I hope you catch that wave soon, too. Cant wait to make this Saturday! Farmers market are full of these…. Perfect! Hope you love these, Sue. I was a subscriber. I wanted to read the recipe for the spaghetti squash, but couldn’t get to it because I had to subscribe. So I unsubscribed. Did anyone check this before you put people in this position? Pretty sloppy. If you lose a lot of people, you’ll know why. I got to the recipe finally, which I like a lot. I guess it’s the last one for me. Hi Jo, I’m so sorry you had trouble with my website. The recipes are always available on my website, at no cost, no subscription required. That popup should only show up once every two weeks. Regardless, you can click “no thank you” or just click outside of it and the box will go away. You are always welcome at Cookie and Kate! This looks amazing! I’ve never thought about making the spaghetti squash a bowl. I’ll definitely have to try it! Thanks, McKel! It makes a great bowl. I caught a glimpse of your NYC trip on Instagram yesterday, looks like so much fun! Just saw this in my inbox, and it made my day! I love your email updates, and the wonderful recipes they contain :) Can’t wait to try this one! oh yum! I need to give this one a try! actually grew spaghetti squash for the first time this year! How exciting is that! Oooh, super exciting! Way to go! That’s wonderful to hear, Loraine! Thank you. I hope you love this one, too. I really, really REALLY love all of the variations you do on recipes Kate! It makes it so easy to follow along, which means I get to cook more fun, healthy weeknight meals. Thank you! I’m all for scarf weather. 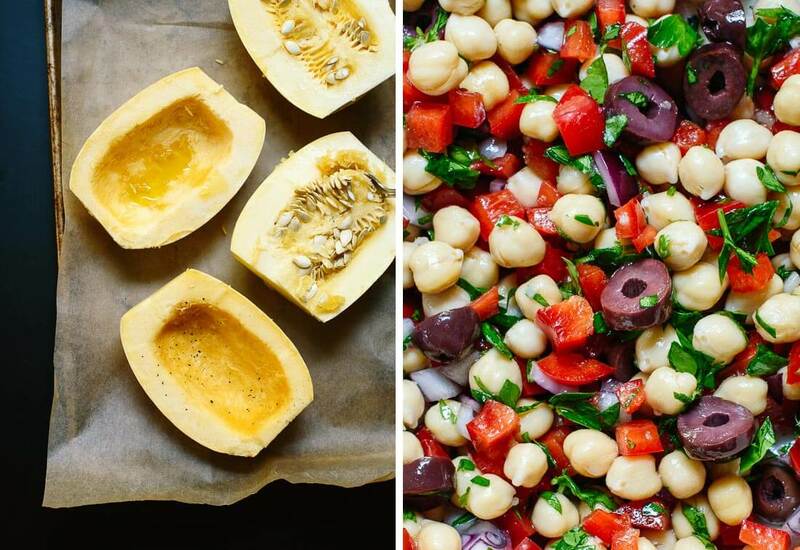 These squash bowls look delicious- I love the chickpeas and pesto in it. Me, too! I can’t wait. This looks so gorgeous! I can’t wait to try. Question – my spaghetti squash tends to get a pretty watery after cooking. This can end up watering down my toppings a bit, too. What am I doing wrong? Thanks, Heather! I hope you love it. I hate it when that happens. I think some squash are more watery than others, but are you roasting them with the cut sides down like I did in this recipe? I think that helps prevent moisture from pooling inside. Kate, I simply love you! Your recipes are so simple and delicious! While it takes much inspiration and ingenuity for you to put them together, we are supplied with “easy to perform, great to eat”. We are so busy and most everything is homemade, so through our construction, paperwork and other “stuff”, you are helping us through…deliciously. Lani, thank you! I really appreciate your kind words. Definitely need to hear them! All my best to you and your family and I hope construction is going well! Kate, this is genius! I am about as sick of spaghetti-like spaghetti squash dishes as can be. A meditteranean spin on it is right up my alley!!! I just made a fresh pesto and have leftovers! How wonderful!!! Ooooh and its a reason to gush over the olive bar!!!! Thanks, Maria! I hope you love this one! Cookie & Kate, you have outdone yourselves with this one! I just made it tonight and it is amazing! 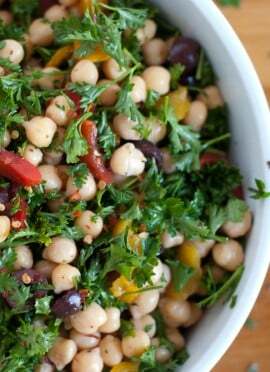 So flavorful and healthy and filling and creative. I eliminated the cheese to make it vegan. I love that it’s gluten free and seasonal. Delish. Even the chickpea filling by itself is tasty. I’ll make that in the summer for a quick salad. And the pesto – I’ve been trying different tricks to no avail – but this is my new go to pesto. Thanks for all or your efforts and sharing your amazing creations with the rest of us. Thank you, Amanda! Really happy to hear you enjoyed it. I love that pesto! This was SO good! I switched up cilantro for the flat parsley (that’s what I had) and I added some left over roasted corn and about 1/2 of a jalapeño pepper. I LOVED the pesto sauce on top of it all. I can’t wait for the leftovers! As for the comment from the person that unsubscribed…her loss! I love your recipes Kate and your commentary as well! Keep it all coming! Give Cookie an ear scratch for me! Thank you so much, Kathy! I’m really glad you enjoyed this one so much. Your version sounds awesome! I love spaghetti squash, I’ve only had it once as my parents grew a few. I have no idea where I could buy one, unless I would eat them a lot more often!! I wanted to say thank you for your recipes. Especially your spaghetti squash bowls. Your site has been so crucial for my cooking in the last year. I recently weaned a baby with non-IgE allergies to most things under the sun–dairy, soy, nuts, gluten, chocolate, coconut, and corn. I thought I was an accomplished cook, but with such a limited diet, being creative was super hard. Many days I felt like I ate plain oatmeal or beans and rice for every.single.meal. Thanks for making allergy-free cooking fun–you always have recipes that put a twist on the staples we can eat, and you always have a suggested modification or an easily modified recipe. I suggest your site to every allergy mama I know. Sites like yours make a difference in the quality of life of many people! Cat, thank you so much for your note. I’m really glad to hear that you find my site useful! I do my best to offer dietary notes when I can, so it’s nice to hear that they are appreciated. I hope you and the baby are eating happy now! Squash bowls are so whole and filling; great utilization. Everything added to it was so yummy! I am growing these in my backyard, can’t get them in the Uk, spotted your recipe last year and I just had to try them!! Am keeping my fingers crossed they get big enough so I can try them soon! 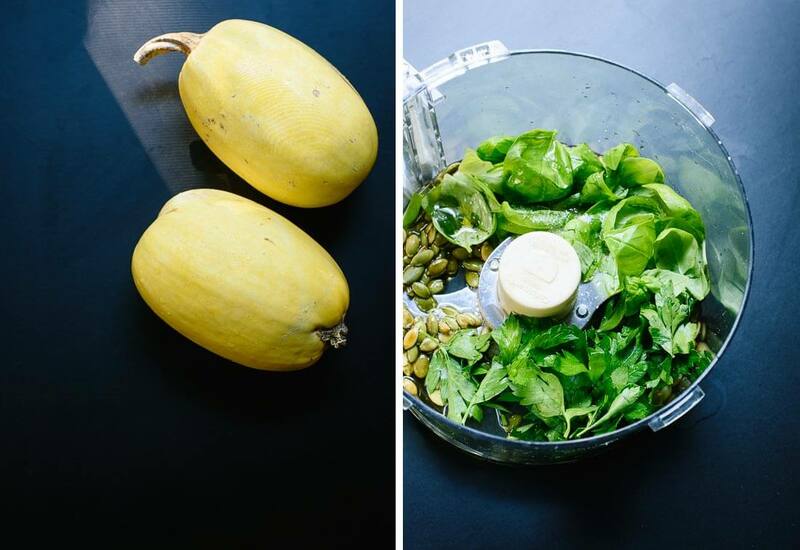 My favorite time of year – spaghetti squash season! Amazing. Kate you did it again. I was surprised gow easy and delicious the pesto was. This recipe was super easy and absolutely delicious. Kate, you are my hero. Thank you, Mer! Blushing over here. :) So glad you loved this one. This. Was. Marvelous! I left out the olives and bravely served it to workers doing some landscaping and they LOVED it! I was worried about the pesto being too zingy, but it’s not as pronounced when assembled with everything else. Thanks for another amazing recipe as I’m never disappointed with Cookie and Kate! The first time I had spaghetti squash was about 2 years ago. I had not heard of it actually, and my mother made some when my wife and I were visiting my parents. It was delicious! 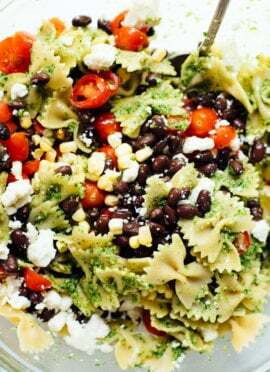 I will have to give this recipe a go the next time my parents come and visit us, for we are also pesto fans. Thanks! This looks really good! I would have never thought to use Mediterranean flavors with spaghetti squash. I’m usually really picky with pesto, some I’ve had are delicious and some are not… so, I’m usually hesitant to make pesto. But, this looks so good, I’m going to go for it! Thanks for sharing!! I hope you love it, Russell! The only pestos I don’t love are the store-bought kind, but I think this one’s a winner! Hope you’ll agree. Ah, this looks so good! 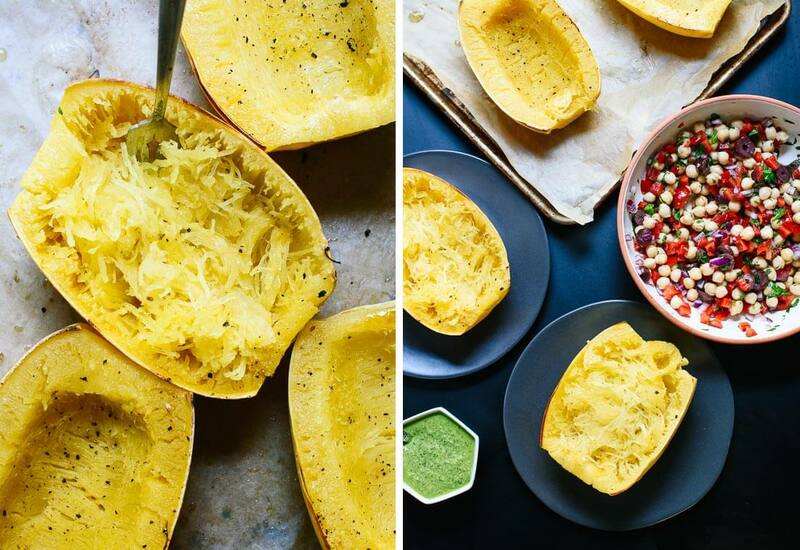 What a clever idea to eat from the actual spaghetti squash skin! Made this for dinner tonight. I’ve made this twice in the last month. Obsessed is an understatement. Love your recipes!! Made these bowls tonight. They were absolutely fantastic! Filling and refreshing. Thanks for inspiring us! OMG, OMG, OMG – I just made this and it was incredible!!! Your recipes have been a very welcome addition to my rotations, and this one is a super star! What an honor! So happy you loved it, Laura :) This comment made me smile. This was an amazing recipe. I didn’t have a food processor so we got creative with the pesto but it still came out delicious and I just finished eating the leftovers on day two. 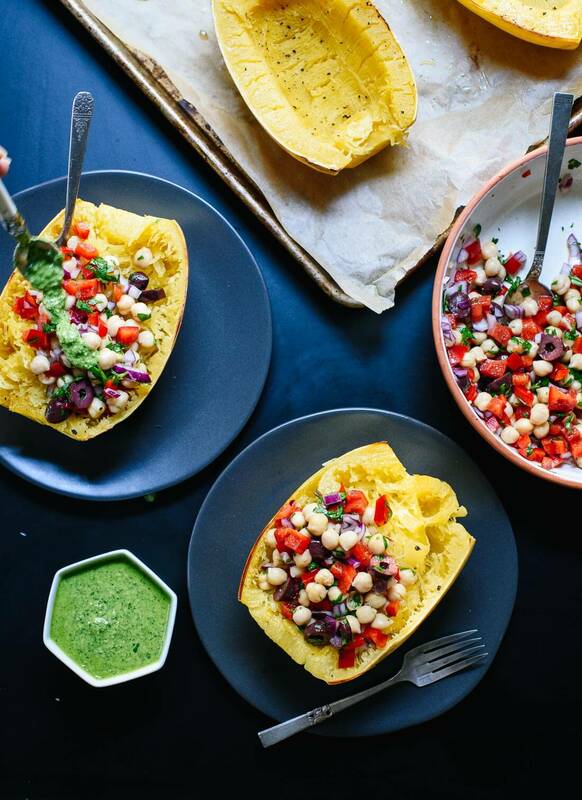 We just made mediterranean spaghetti squash bowls tonight for 5 people…. RAVE REVIEWS!!! We love your recipes and this one was no exception…. maybe even the BEST EVER…. the amazing mixture of hot (squash) and cold (chickpea salad) and crunchy (onions/red bell peppers) and tangy (pumpkin seed pesto with lemon) were so amazing!!! We added a side of tazeeki sauce that we had in the fridge, along with the suggested feta cheese (we omitted the olives by personal choice). I can’t wait to try the Mexican version of the squash recipe. Thank you so much. Soooooo delicious!!! Just posted a picture of mine on my Instagram @dragon_king_daughter. Check it out! I definitely will, Jes! Make sure you tag it #cookieandkate. 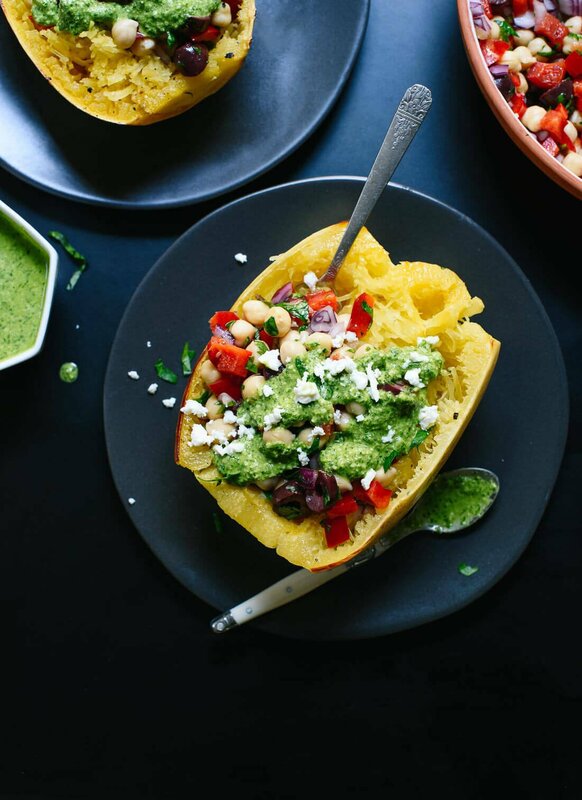 Your Mediterranean Spaghetti Squash Bowls recipe is definitely a keeper! I cheated because I was lazy and made them with purchased basil pesto but, nonetheless, enjoyed the meal very much. As advertised, the leftovers are just as good as the original if stored separately. I just microwaved the squash to reheat, then assembled. Thanks for yet another great recipe. And congratulations on your cookbook — I look forward to exploring more recipes from it soon! Awesome! These do keep really well if you store them properly, so I’m happy they made great leftovers. Hi Cookie, please tell your person that this was absolutely delicious. I am planning to serve it for a dinner party. Do you have a serving suggestion for what would be a good accompaniment? Of course there will be a chocolate cake too. It is almost 100°here, but this meal was worth heating up the house. Hi Beth! (It’s Kate.) I’m so glad you enjoyed this one. I’d probably serve it with a big salad. This one might go well, and you could simplify the ingredients a bit if you’d like. Hi Kate, Thank you for your salad suggestion. It was a really good match, the romaine had a nice crunch that my usual salads with spring mix don’t offer. I left out the garbanzos. The squash dish has been requested for a 3rd time this week. Tried this and it was excellent like all your stuff Kate. 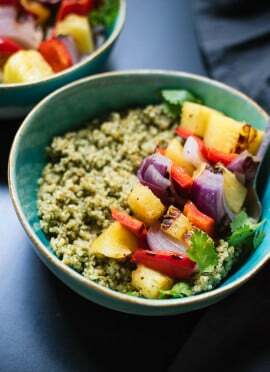 We are newbie vegans and having great fun trying out your recipes in your book and online and finding that we are not giving up anything in regards to taste and overall eating enjoyment. We’ve tried something like 15 of your recipes and you haven’t missed yet. I’ve never had a cook book before with nearly as high a batting average. Thanks for all the care you take to get things right. You are sweet, Jennifer! I am glad you have found success and that they work for your family :) I appreciate the review very much! Delicious! The spaghetti squash turned out perfect (which I usually have a hard time doing). The only thing I couldn’t quite get right was the pesto sauce – mine was chunky and didn’t get creamy at all (very well could be my blender though). Still yummy on top though, and a great alternative to typical spaghetti. Really enjoyed this recipe. Easy to make and something different and delightful while healthy. My husband normally doesn’t like Kalamata olives or Feta cheese – but really enjoyed both in this recipe. Yay!!! Hooray! I’m glad both you and your husband enjoyed the recipe. Thank you for sharing, Mary! I appreciate it. Made this for tonight, looks so yummy. I was supposed to wait, but had to sneak a taste, just wonderful. Spaghetti squash is so fun, and love your recipe. I did use sweet peppers and leeks instead. I love that you got a taste. It’s the cook’s right! :) Thanks for sharing, Colette! Kate, I looked around all day for a recipe to make on the Mediterranean diet and settled on yours. It was absolutely delicious!! Also small world cause I also live in Kansas City, keep up the great work! I tried the Mediterranean Spaghetti Squash Bowl Recipe. I don’t care for Chickpeas, so replaced them in the recipe with “seasoned” Black Beans (careful…not black bean soup). I didn’t have on hand all the ingredients for the Parsley-basil Pesto, so I left it off. It was just delicious & quick. The family loved it. What a complimentary flavor those seasoned black beans added. start them out with minimal seasonings (salt, & butter, & maybe a little sweetening), to avoid any digestive distress from stronger seasonings…save those for later in their new food growth. Thank you for sharing, Kakie! I’m so happy you did, Michaela! Thank you for your review. I made this— it was AMAZING!! Especially the pesto ! My one complaint was the chick peas were too hard. I am not sure what to about that ? Marinate in lemon juice & white vinegar? Or simmer the chick peas ? I’m glad you loved the pesto! Chickpeas are tricky sometimes. Some cans are more cooked then others. It’s frustrating, for sure. I made the Mediterranean garbanzo pesto spaghetti squash version, and it was incredibly delicious and very nutritious. I am going to use this recipe as one of my main staples for eating healthy. Thanks for sharing the recipe. It really was incredibly tasty. I could easily eat one of these every day and not get tired of it. All the possible variations for what you can stuff the spaghetti squash with will keep things interesting. I am going to try adding some quinoa into the Mediterranean salad next time. Thanks for your review, Terry!